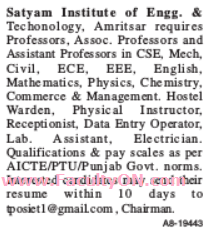 Satyam Institute of Engineering & Technology, Amritsar has advertised in the TRIBUNE newspaper for the recruitment of Professor / Associate Professor / Assistant Professor Plus Non-Faculty jobs vacancies. Interested and eligible job aspirants are requested to apply within 10 days from 20th June 2018. Check out further more details below. About College: Satyam Institute of Engineering & Technology, Amritsar established by SBS group is one of the growing educational institutions in northern region with motto to develop and transform society through quality education. We firmly believe that engineering graduate is an emissary to the global industry and we have an excellent combination of industry professionals and academicians on our board, who provide a holistic view of engineering operations to our students. How to Apply: Interested and eligible candidates are requested to send their updated CV along with copies of certificates and recent PP size photo to the following email address.